Do use fresh, contact lens cleaning solution every time. Don’t use tap or sterile water, saliva, saline solution or rewetting drops. None of these serve to disinfect and properly clean your contact lenses. Do rub your contact lenses with your fingers, and rinse them with fresh cleaning solution afterward. How do you put contact lenses in? Pour the old solution with the lens into your hand. Then place the lens on your finger. 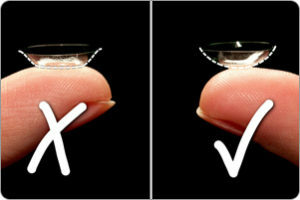 How can you tell if your contact lens is inside out? Take one of your contact lenses and place it on the tip of your finger. Make sure the edge of the lens is pointing up. Now, bring your finger close to your eyes and look at the lens from the side. The lens is correctly oriented if it forms a cup-shape with its edges in an upright position. What happens if my contact lens is inside out? And don’t worry — you won’t harm your eye or your contact lens if you put it on inside out. In most cases, you’ll be able to tell almost immediately if a contact lens is inside out. Typically, the lens will feel uncomfortable and will move too much when you blink. It also may move off the center of your eye or pop out. Why do my contacts not stick to my eye? Make sure your fingers are dry. REMEMBER – a lens sticks to wet surfaces (like the eye) better than dry surfaces, so if your finger is too wet, it will keep sticking to your finger and when you try to put it on the eye, it won’t adhere properly. Gently place the lens on the eye. Why do I see blurry with my contacts? When using rewetting drops, be sure to use a drop that is designed for your particular lens material. If the eye itself gets dry, this can also cause the vision to appear blurry. This can occur with or without contact lenses in. Some people just don’t produce enough tears and can suffer from dry eye disease. Contact lenses are very safe. Still, wearing contact lenses can damage your eyes if you wear them too long, fail to clean them properly or do not replace them as directed by your eye doctor. Contact lenses are considered medical devices and are regulated by the U.S. Food and Drug Administration (FDA). All our lens are FDA approved and that is labelled on all lens packaging. Beware of other sellers who try and sell fake versions of the brand (they are nowhere near as pigmented and can damage your eyes). What kind of eye drops to use with contacts? Ask at your local chemist what eyedrops are appropriate for contact lens use. Are contact lenses that uncomfortable? Protein. Depending on what kind of contact lenses you wear and how much protein your eyes deposit on your contacts, your doctor may recommend you use a product for protein removal. If your eyes feel dry, you may want to re-wet your contact lenses with lubricating drops. While cleaning them does remove some protein, it can still build up on your lenses and make them uncomfortable. That’s why the longer you wear lenses before replacing them, the more likely you are to need a protein remover. For example, if you wear disposables, you probably won’t need one; but if you wear the kind of lenses that are replaced only once or twice a year, you definitely will. Products for removing protein include enzymatic cleaner and daily protein removal liquids. It’s really simple all you do is soak the lens in the enzymatic cleaning solution once a week (this can extend the life of the lens if they have protein build up and feel uncomfortable). Ask your local chemist for more information.